Good morning! I haven’t posted in a while…I’m sorry! The long weekend just kept me busy, and I never got around to getting a post up. Today I want to share with you a recipe I created last week for the War Between the States battle our town had. The treat Luke wanted me to bring was oatmeal cookies. 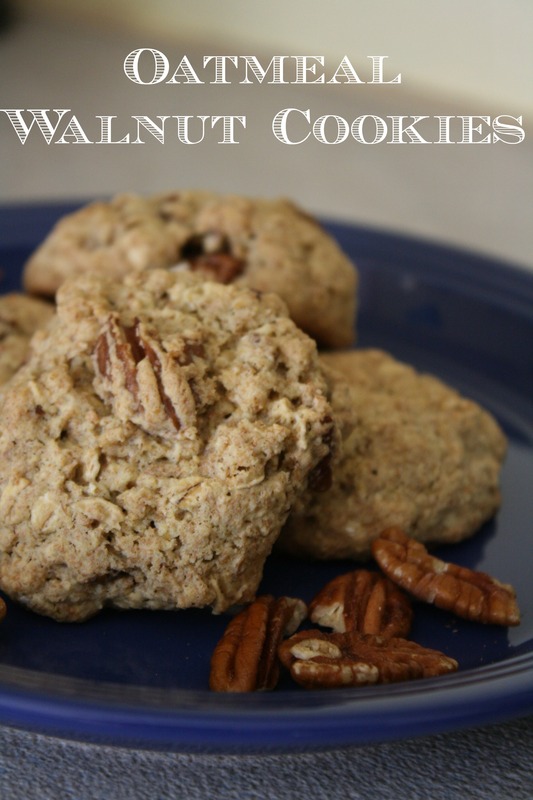 I’m not a huge fan of oatmeal cookies…or nuts…but these cookies were out of this world! The recipe would have made more cookies if the baker hadn’t had a couple bites of the dough. Ahem. In a large bowl, beat butter, sugar and eggs. Gradually blend in dry ingredients. Lastly, fold in oats and walnuts. Shape into balls and bake at 350 for 12-15 minutes. These should make 18-24 cookies, depending on how much dough you sample. 😉 Enjoy!! What’s your favorite cookie? Do you like nuts in yours? Does your town have any war reenactments? The cookies look yummy! 🙂 And the reenactment was fun! oh wow, this looks like a delicious recipe! i love walnuts in baked goods; i’m thinking a good add in might be dried cranberries or raisins. I’m looking for a raisin and coconut cookie can anyone help me please.